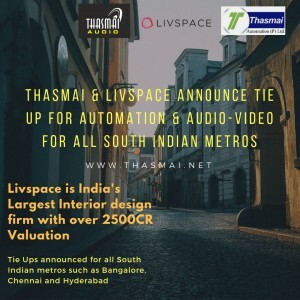 Home Improvement | Thasmai Automation Pvt. Ltd.
Thasmai is glad to announce tieups with LivSpace (India’s fastest growing Home Interiors company) and DashSquare (South India’s largest Luxury furniture) retailer in all our stores across Hyderabad, Bangalore and Chennai. Now check out the latest Home Automation & best Home theaters in a store in your city!